We have some wonderful new cotton ribbons at Treadle. In an easy-to-blend cream color and printed with sewing notions and sweet messages, they have an appealing simplicity. Cotton ribbons have a lovely feel, not shiny or slick, but smooth and natural. Like twill tape, they make great drawstrings, either for garments or crafts. Try using them for drawstrings in pajama pants or crafts like bags or paintbrush rolls. Decorate the hem of a skirt, or use as applique on a quilt! The "handmade with love" ribbon would even make a sweet little tag inside a garment. We have so many beautiful ribbons and trims in the store. Come take a look! 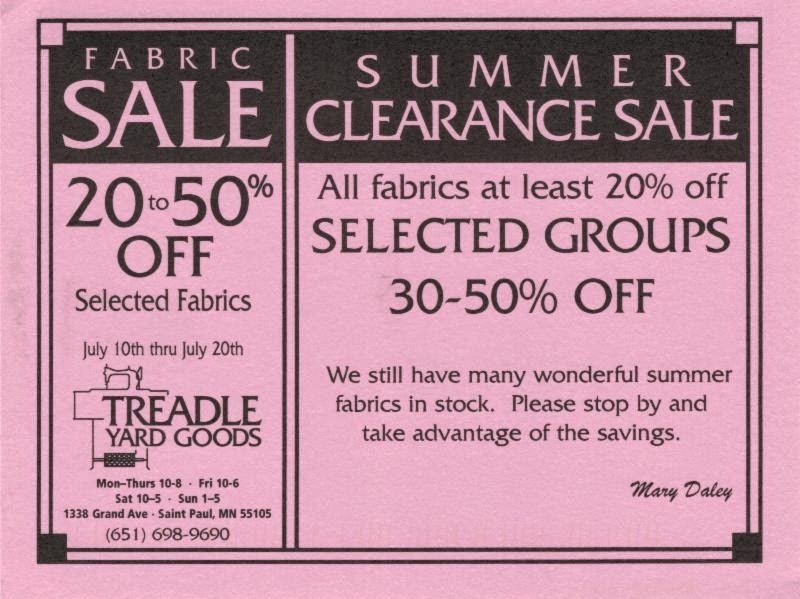 It may still be summer, but wools are starting to arrive at Treadle! We have a luscious selection of new Italian wools that will make you swoon. It's never too early to start sewing a winter coat! A well-made coat is an anchor in your wardrobe that will carry you through years of use. Choose a dreamy, good-quality wool, take your time with fitting and careful construction, and you will end up with an enviable coat that feels great to wear and looks fabulous. Stop by soon; no matter what the season, wools like these won't be around for long! We have some wonderful new knits from Art Gallery fabrics, known for creative, beautifully-designed prints. Each of these fabrics is a soft, breathable cotton knit, with just enough spandex added to help the fabric keep its shape. Knits like these sew up so fast and look so flattering! Find your perfect knit, and make yourself something new for your summer wardrobe. We have this amazing new panel print from Riley Blake. Each panel is composed of four different large-scale motifs in wonderfully crisp, graphic patterns. These would be perfect for modern quilting, pillows, or enviable bags. We also have this great coordinate piece featuring an allover floral design. Here you can see the scale of the entire panel. Our Summer Sale ends Sunday! Stop by for your chance to get get great bargains on wonderful fabrics! Our Summer Sale runs through Sunday! Stop by for at least 20% off EVERY fabric in the store! Birch fabrics has a new line featuring the prints of illustrator Charley Harper, known for his sleek, abstract representations of wildlife. These prints have a crisp, modern edge and colorful appeal. Best of all, they are printed on 100% organic cotton, better for the earth and for you. We have prints in several weights and weaves, including broadcloth, canvas, and jersey knit. Our Summer Sale started yesterday and is still going on! Stop in for at least 20% off every fabric in the store, plus groups at 30-50% off! Our Summer Clearance Sale starts tomorrow, Thursday, July 10th! There are so many fabulous goodies at reduced prices - come take a look! We have some beautiful new prints from fabric design superstar Anna Maria Horner, and the best part is they are in delicious summer fabrics! Cotton lawn, rayon challis, and cotton knit bring Anna Maria's artistry to a broader range of apparel sewing. You might recognize some of these prints; we had the cotton broadcloth versions of a couple of them in May, which you can see here. While cotton broadcloth prints are fun and work great some some types of apparel, these voiles, rayons, and knits are in another world; they are fabrics specifically designed for clothing. Treadle will be closed today, Friday July 4th. We will be open regular hours the rest of the weekend: 10-5 on Saturday and 1-5 on Sunday. Have a fun fourth! Find Waldo on Grand Avenue! Where's Waldo? On Grand Ave, of course! Now through July 30, stop by up to 25 local businesses on (or around) Grand Ave. - including Treadle of course! - to see if you can spot Waldo! Pick up your passport at any participating business, collect a stamp from each place you find Waldo, and turn in your stamped passport at the Red Balloon Bookshop to enter in a prize drawing! This is a fun way to get out into the neighborhood, enjoy a walk, and see new places. See all the details and the full list of participating businesses at Red Balloon Bookshop's Find Waldo Page. More of our new Japanese imports: Echino linen and cotton blend prints. Everyone loves the bold colors and creative, unusual graphics of Echino prints. The linen blend is heavy enough for bags and wallets, but soft enough for skirts or jackets, too.